Endometrium is the lining of the uterus. The cancer type that affects the cells of the endometrium is called endometrial cancer or sometimes uterine cancer. Although there are other types of cancers that affect the uterus, the endometrial is the most common. 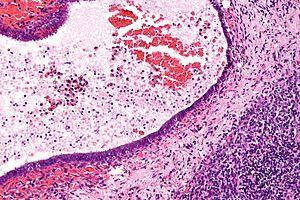 The symptom that occurs in early stage of endometrial cancer is abnormal vaginal bleeding. Due to early diagnose, there is a good chance of removing the uterus surgically and often eliminating the cancer completely. Studies imply that certain risk factors may increase the chance of endometrial cancer. Hormonal balance change (estrogen and progesterogen) in the female body may cause changes in endometrium. These changes may occur due to disease, irregular ovulation patterns, polycystic ovary syndrome, diabetes, obesity or other conditions. The increase of estrogen in the body is mostly the factor. After menopause, consuming hormones that have estrogen but no progesterone increases the risk of cancer. In case of prolonged endometrium is exposed to estrogen the endometrial cancer risk increases. This includes the cases of early age menstruation (before 12) or late menopause. Women who have never been pregnant have a higher probability of endometrial cancer. The risk also increases with age, after menopause. Hormone therapy after breast cancer uses tamofixen drug. Tamofixen is hormone based and increases endometrial cancer risk. Hereditary nonpolyposis colorectal cancer (HNPCC) is an inherited colon cancer syndrome. This means that the mutated gene is inherited from a parent and increases the risk of colon and other types of cancer. Being diagnosed with endometrial cancer invokes fears, concerns and questions. The important thing is to know that no one has to face the fear and questions alone. There are plenty of resources that provide both support and answers. By consulting the doctor it is possible to find out about the stage of cancer, treatment types and choices and side effects. The additional sources of information are libraries and the ever growing internet. People at National Cancer Institute (NCI) are always willing to provide support and answers regarding treatment and coping of cancer. Enough information makes cancer care decision making easier. It is important to keep a strong support system that includes friends and family that help coping with the treatment. Many people are affected by all types of cancers, and sharing ones experience with them has shown very helpful. These support groups can be contacted through local doctor. Living with cancer and treating it is very tiring and discouraging. This is why it is very important to take an active role in one’s own treatment and not just give up.